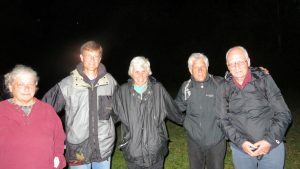 Gerd Büntzly (right) with anti-nuclear activists before entering Büchel Air Force Base on July 17, 2017. An appeal court trial for Gerd Büntzly, 69, from Herford, Germany, will begin Wed., Jan. 16, 2019 at 2 p.m. in County Court Koblenz, Germany. Büntzly has appealed a January 2018 conviction on trespass and property damage charges stemming from a July 2017 protest at the Büchel Air Force Base, in Germany’s Eifel region, which experts say deploys at least 20 U.S. nuclear gravity bombs for use by the German Air Force. Büntzly was sentenced to a fine (40 times his day’s wages) that could translate into 40 days in jail. International law experts from the US and Germany have condemned “nuclear sharing” as a violation of the Nuclear Non-Proliferation Treaty (NPT), which both the U.S. and Germany have ratified. The NPT’s first two articles prohibit the transfer of nuclear weapons to or from other countries that have ratified it. Anabel Dwyer, an international legal expert from Michigan, has submitted a formal Declaration on behalf of Büntzly, arguing that citizens are permitted to try and prevent unlawful or criminal government conduct, especially alleged violations of Treaties outlawing the planning of war crimes. Marion Küpker, spokesperson for the German-wide campaign “Büchel is Everywhere: Nuclear Weapons-Free Now!” also said that Büntzly’s nonviolent civil resistance was justified. “In 1999, a Scottish court recognized a ‘defense of crime prevention’ under international humanitarian law, when it acquitted three women who had acted against Britain’s Trident nuclear submarine program by throwing parts of its maintenance system into the sea,” Küpker said. Germany’s “Büchel is Everywhere” campaign has now been endorsed by 60 groups and organizations, and sponsors a nonviolent action camp outside the Büchel base from March 26 to Aug. 9. In the past two years, more than 60 individuals have joined “go-in” actions during the weeks of peace camp. In 2019, there will be another 20 weeks of nonviolent protests at the base. Know so many of us stand with you, behind you, beside you….. full of gratitude for you John, Susan, Marion and you especially Gerd. All who support Büchel is Everywhere. This is our world, our nations, our challenge, in our name…. so we appreciate this action so greatly. Was with Martha of the Kings Bay Plowshares 7 this morning…. know they each walk hand and hand with you. It’s illegal, immoral…. criminal…. We rejoice in every bit of widening the truth out there…..!! Thank you Anthony. And thank you for your work doing the same!